Davies Vineyards was first established in 2001, when Schramsberg Vineyards vintners released their first Cabernet Sauvignon bottling from the vineyards on the historic Schramsberg property in Calistoga, CA. Originally founded in 1862 by Jacob Schram, the 218 acre Diamond Mountain District property was re-established by sparkling wine producers, Jack and Jamie Davies in 1965. The vineyards were planted then to the traditional Methode Traditionnelle grape varietals of Pinot Noir and Chardonnay. Over time, it was discovered that the site was better suited to the Bordeaux varietals of Cabernet Sauvignon, Malbec, Petit Verdot, Cabernet Franc and Merlot. The vineyards were replanted to Bordeuax varietals in the late 1990s and early 2000s. In 2009, Davies Vineyards produced its first still Pinot Noir wines, and has continued with a focus on this grape varietal by sourcing fruit from small, talented growers that allow the winemaking team to craft single vineyard bottlings that highlight specific sites. In 2012, the Cabernet Sauvignon program was expanded with the philosophy that had been started with the Pinot Noir program a few years earlier, once again sourcing grapes from single growers that would provide the winemakers the chance to bottle delicious vineyard designated Cabernets from different pockets from around the Napa Valley. The Davies Vineyards Grayson Building is a beautifully designed space where the community and visitors can taste a selection of the Davies red wines that are produced next door. The building's exterior design, reflective of older buildings and wineries in and around town, features stone that was quarried from the local Mayacamas and Vaca Mountain ranges. The interior also has elements of local stone, as well as recycled barn wood siding and exposed steel beams that support vaulted ceilings. The walls are finished with heirloom Native-American textiles from the collection of family patriarchs Jack and Jamie Davies, along with images of select Cabernet Sauvignon and Pinot Noir vineyard sites that are the sources for the Davies Vineyards wines. To join the wine club, visit www.daviesvineyards.com or call 707-963-5555. Jack & Jamie's Circle - $350 per shipment, includes various quantities of J. Davies and Davies Vineyards wines. 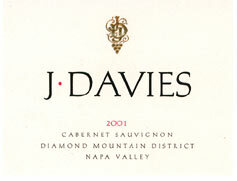 Davies Club - $120 per shipment, includes various quantities of J. Davies and Davies Vineyards wines. 15% discount on selected wines year-round Hours: Daily, 9:00 a.m. - 5:00 p.m.